Consumer giants Unilever and Marks & Spencer last year vowed to source raw materials from jurisdictions that “pursue comprehensive forest climate programmes” like the one the Brazilian state of Pará launched in 2011. Here’s how the state got ahead of the curve, and what it means for deforestation in the Amazon. 29 March 2016 | Former Brazilian President Inácio “Lula” da Silva may be in hot water these days, but he was riding cool and easy in 2009, when he pledged to reduce his country’s greenhouse-gas emissions to a level roughly 17% below 2005’s emissions by 2020. It was an astonishing ambition, especially for a developing country, because most of them weren’t promising to reduce their emissions so much as keep them from rising too much. Lula’s pledge, though non-binding, was not only ambitious but eminently realistic. In fact, he’d been working on it from the day he took office in 2003, and was almost finished by the time he made his dramatic 2009 pledge. Unlike the strategies of industrialized countries, Brazil’s isn’t built on fixing factories, but rather on fixing farms – and eliminating in the process 80% of the country’s deforestation. By the time he left office in 2011, Lula’s plan was on track to more than meet his targets. Although the trajectory took a hit with resurgent deforestation in 2015, current President Dilma Rousseff says the country is still on track to see 2025 emissions 37% lower than 2005’s, and by 2025’s down by 43%. Both projections are contingent on keeping deforestation in check, and that’s dependent on developments at the state and municipal level – like Pará’s effort to replicate the municipality of Paragominas’s success across its jurisdiction. While in office, Lula created an arsenal of sticks and carrots to encourage states and municipalities to slow deforestation. The heaviest stick was the Black List of high-deforestation municipalities. Any district on the list saw its finances choked and its exports embargoed. Among the carrots were loan guarantees and open markets, as well as the possibility of carbon finance for reducing emissions from deforestation and degradation of forests (REDD). The blacklisted municipality of Paragominas responded by working with The Nature Conservancy (TNC) and Imazon (Instituto do Homem e Meio Ambiente da Amazônia, the “Institute of Man and Environment in the Amazon”) to restructure its rural economy in more sustainable ways – providing in the process a template for other municipalities to follow suit. 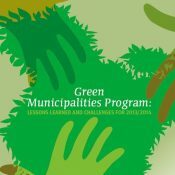 Brazil’s Green Municipalities: What Works? What Doesn’t? Why? By 2009, TNC and Imazon were expanding their efforts into more isolated and challenging municipalities like São Félix do Xingu, on the frontier of deforestation, while the former governor of Pará state, Simão Jatene, was harvesting the lessons of Paragominas to build a sustainable development platform that he hoped would propel him back into office. Jatene aimed to slash the state’s deforestation rate 80% by 2012 compared to the average rate from 1996 through 2005, and his pitch was pure business. Major companies, he argued, don’t want deforestation in their supply chains, and jurisdictions that can demonstrate low rates of deforestation will have an edge over the competitors. His message resonated with voters, and Jatane took office on January 1, 2011. He formally launched the Green Municipalities Program (Programa Municípios Verdes – PMV) in March, 2011 and recruited Paragominas’s Secretary of Planning and Development, Justiniano de Queiroz Netto, to oversee the statewide initiative. Netto’s team reached out to every mayor in the state of Pará, and he found, not surprisingly, that all of those on the Black List wanted to get off, while most of those not blacklisted were open to the idea of higher ambition. Like Paragominas mayor Adnan Demachki before him, Netto emphasized the need for local pacts among all stakeholders, and the importance of getting all local business sectors invested in the process. It also creates a sixth category – the Green Municipality – for those that got 80% of their farms registered on the CAR, reduced deforestation to below 40 square kilometers a year, ramped up land titling, and implemented environmental management strategies. It lays out seven goals based on the experience of Paragominas – beginning with the creation of local pacts among stakeholders and including the incorporation of environmental practices into school curricula. Both Netto and Jatene have taken pains to make it clear that the PMV is as much a development program as it is a conservation effort. In the same document, Netto pointed out that “there is no ‘silver bullet’ capable of defeating illegal deforestation in the Amazon,” because there is no single driver. He emphasized the need for a combination of incentives, support, and punitive measures. In a prophetic sentence, given the recent resurgence in deforestation, he warned that without bottom-up support, any success would be short-lived. Equally prophetic, given the current plethora of zero-deforestation pledges among companies, is the reference to corporate support. Beyond these, the state is planning to reduce taxes for producers that are environmentally compliant and who prioritize land title regularization. Netto says the plan is working. In 2012, Paragominas officially became the first municipality to get off the Black List, earning access to loans and markets for its soy and beef, and also opening a factory that made furniture from sustainably-harvested timber – a critical step, because it provided jobs for now-unemployed loggers. By mapping its territory, farmers were able identify underutilized degraded lands and increase production of soy, while cattle ranchers were able to ratchet up production by incorporating silage into their methods. But progress has been less pronounced in frontier municipalities like São Félix do Xingu.